It is Halloween Month! Finally, October is here and it is time to start thinking about costumes. I’ve already been thinking about Halloween Decor – check out my Boo Sign and Mickey Mouse wreath! It doesn’t have to be October to make me think about Minecraft, have you seen my Creeper Peeps? And I have been all about the homemade costumes for years now. Remember the DIY $20 Knight costume? 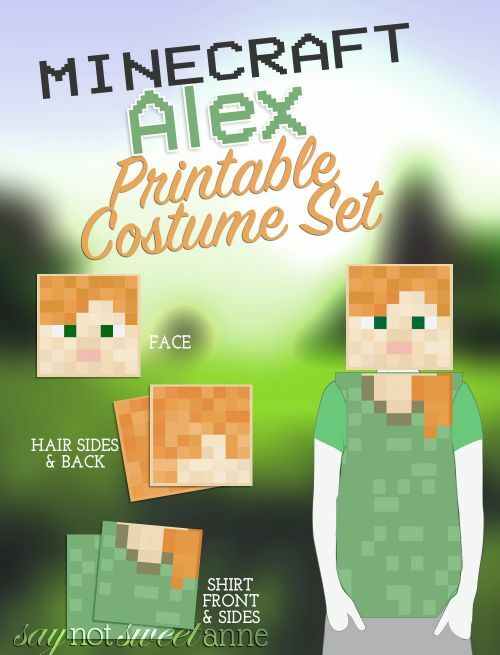 Now there is a Printable Alex Costume. But, I can’t take credit for this one. 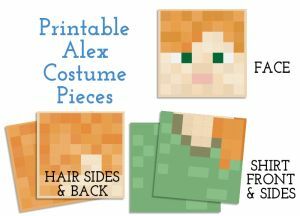 This Minecraft printable Alex costume was a request made by Danna on my Creeper and Steve Printable costume set. She let me know that her daughter was really hoping to dress up as Alex from the game Minecraft this year for Halloween. 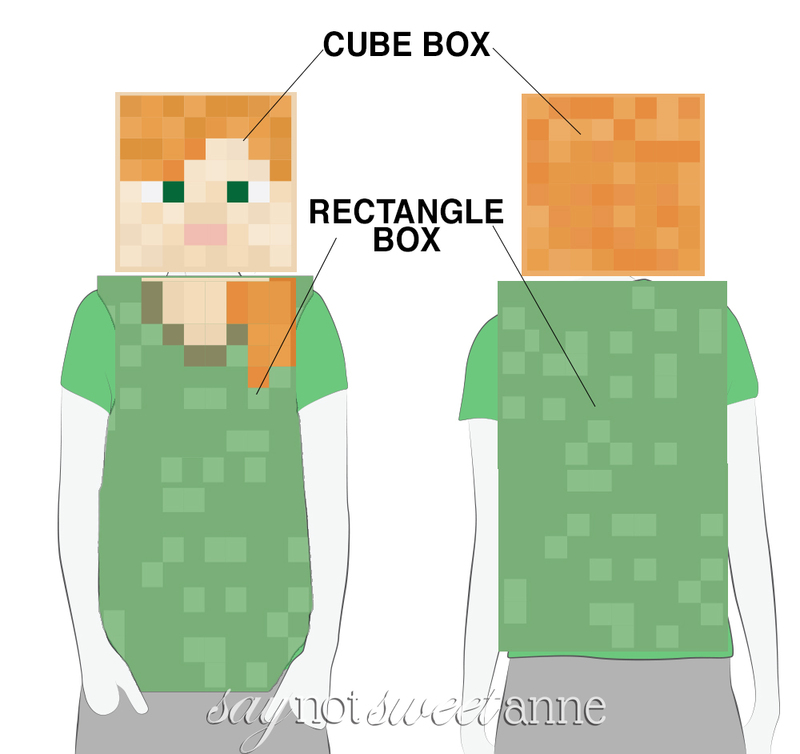 So, I looked a bit closer at Alex and then made a whole new printable costume! 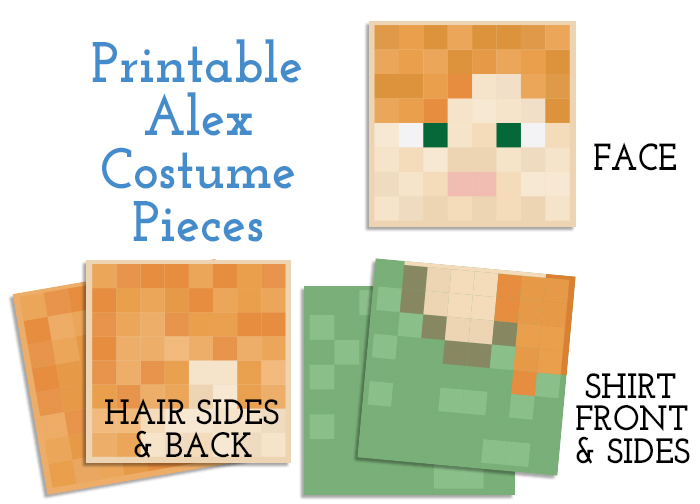 This printable Alex costume is just as easy as the other printable costumes. Basically, it starts with a square box that will fit over your child’s head. From there you print out the head pieces of the costume and glue them to each of the sides of the box. Cut some eye holes, bonus if you keep them in line with the squares/pixels on the face. For a lot of kids that might be all you need! Pair it with a green tshirt and you’ve got an easy and comfortable costume. For those of us that tend to go a bit overboard though, I’ve also included a body print out complete with Alex’s hair hanging on the front of her shoulders. Print as many of these as you need, and paste them onto a larger rectangular box. Cut some arm and neck holes and voila! Your kiddo is a 3D game sprite with pixelly orange hair and sparkling green eyes! Go ahead and download the costume below. I’d love if you reported back with a picture or two! 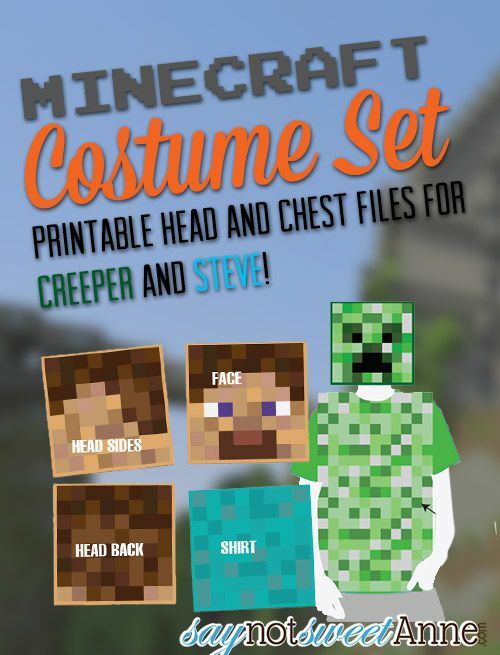 Check out the Creeper and Steve costumes below, and dress up as a family this Halloween! I attempted to download the Alex printout, but I wouldn’t open/download :(. Is there anyway to fix it or even email it to me by chance? Hey Megan, I’ve checked the download and it seems fine. Can you explain your problem a bit? my daughters grade is having a gaming week and they have to dress as their favorite gaming character so this is perfect. Do you have a sense of the box sizes you used for the head and body? Im wondering if I have to resize the pdf pages to get it to fit on a cube for the head and a long rectangle. Hi Situ! Because the largest I could print was 11×17, the box I used is 11×11 inches. However, if you have them printed at a professional shop, or if you print them “tiled” you could do larger boxes.